Carter and I jetted off to The Big Apple this weekend...because we are jetters like that. Actually, Carter's siblings live in NYC, so we planned a week or two ago to head up to spend some quality time with them...and since this was to be a family QT weekend, I was not to camp out at fabric stores and spend hours hitting up the home decor hot spots in NYC (keep in mind, I have no idea where said hot spots are, but I imagine I would sniff them out). Saturday morning, we awoke to a beautiful day in the city - a balmy 50 degrees with the sun shining - and my dear bro-in-law Jason had planned a lovely brunch for us. 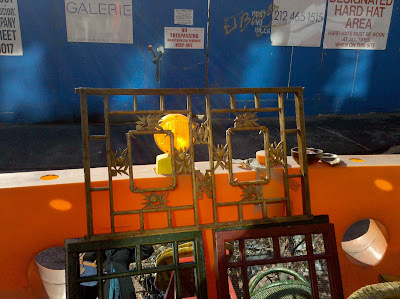 So we hopped a cab (the boys know me very well) and as we stepped out at the corner of 39th and 9th, something immediately caught my eye...a white sign that said "Hell's Kitchen Flea Market." Ummm...wait, what? HKFM!? It was my lucky day! 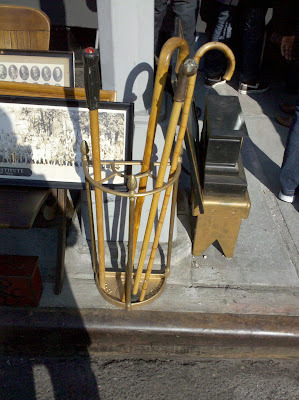 I wasn't even looking for a design adventure...and one found me! That's my b-i-l Jason checking out a bookcase...he's looking for a bar for his (super-cute) apartment and we ended up falling in love with the piece. Alas, we didn't quite have the time to jet the bookcase back to his place, but he vows to return to see if it is there in a couple of weekends. 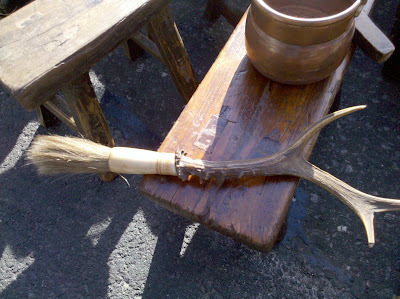 Check out this faux bois one! Pretty cool, isn't it? 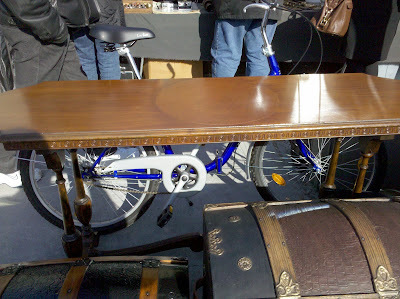 This console table was so charming...I really liked the shape...much prettier in person. 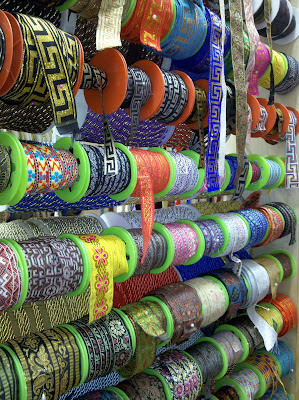 The market was really fun to stroll and although I left empty-handed, the experience was well worth it...the perfect way to spend a very pretty afternoon in the city! 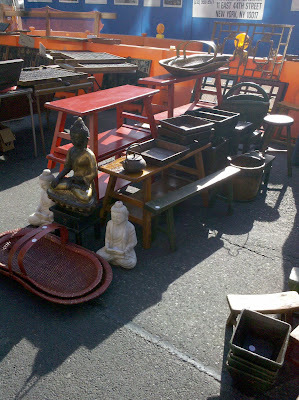 So you would think hitting up the flea market would have been enough of a design adventure...but wait, there's more! 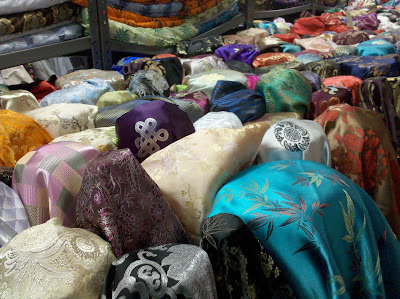 And find I did...rolls upon rolls upon rolls of fabric...I had died and gone to heaven. Carter: You're going out in the rain? Carter: Wow, you must be dedicated. You are in trouble, Missy! And you know why... that is all. I know, I know...but, it was truly family time and we only had about an hour that was unscheduled...but now we are Bolt Bus experts and will hopefully be heading up there more often with a more open schedule for socializing...promise! 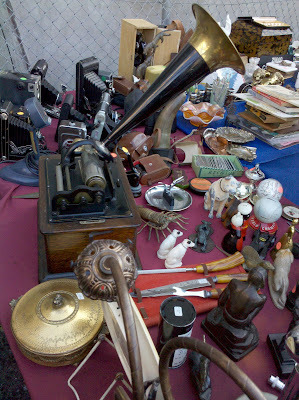 Wow, that's gotta be the best flea market I've ever seen! 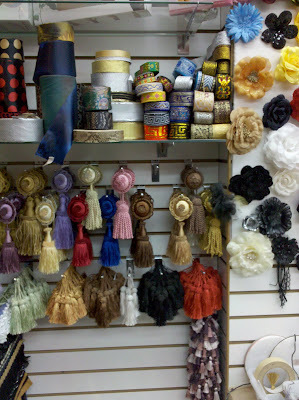 I sorely need to make a trip up to NYC just to hit up the HKFM, the fabric district, ABC Carpet & Home, John Derian and I'm sure about a million other places that you can only get in NYC! Yes, it was wonderful...I only got a taste - I need to go back soon! 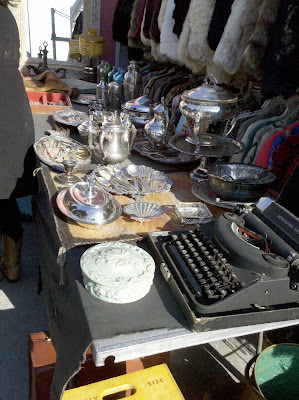 Love seeing your flea market pics!! How were prices? Hmmm...prices...most of the pieces were unmarked (and I didn't inquire about anything)so not too much info on that front...the calligraphy brushes were $25 which I thought was good for very pretty and unique pieces. 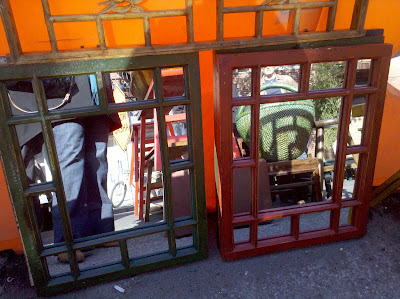 They were my favorite find...and I am KICKING myself for not having bought one...DOH. Very inspiring, especially considering I am going to New York in three weeks! 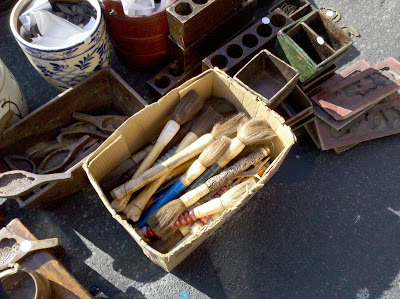 Would you recommend this particular flea market? I know there are many in NY. 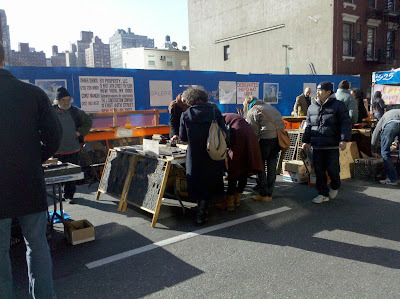 I have done garment district and never miss the crazy wholesale bead shops, but I've never hit a NY flea market- I really need to. 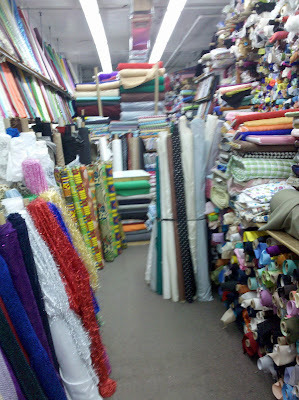 I really loved the HKFM - it's at the corner of 39th and 9th (and thus also quite close to the fabric district). I've also read other NYC-based bloggers post about it, so it's probably one of many good ones. 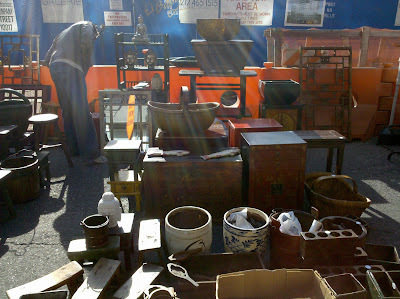 Any other commenters out there that can guide our dear MoS with NYC flea suggestions?